For the month of January we are bringing back our Gift of Health Certificate to help you encourage your family and friends to have a healthy new year in 2015. 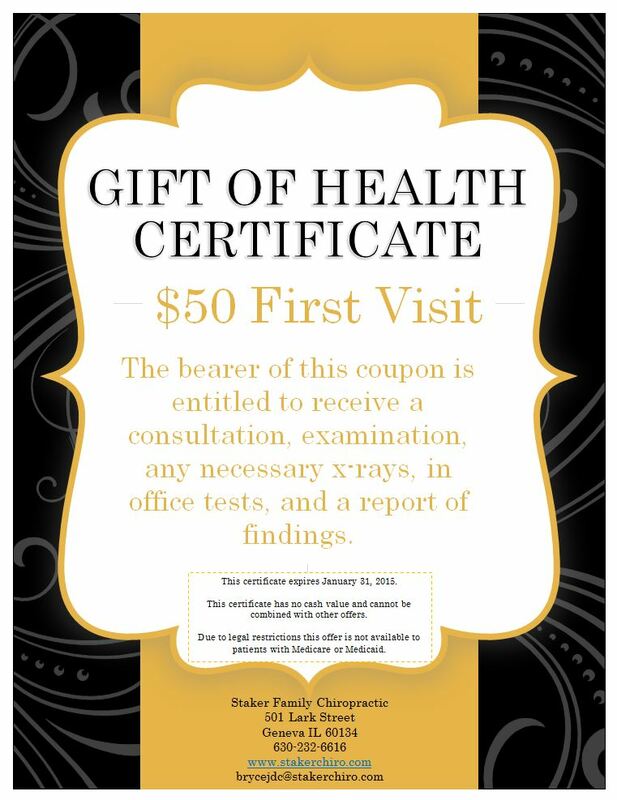 For the cost of $50, the bearer of this certificate is entitled to a consultation, examination, any necessary x-rays, in office tests, and a report of our findings. This is all of our new patient or first visit services that can cost as much as $225.00 for only $50. With this certificate there is no obligation for your friend or family member to receive any care beyond the first visit, this is only an opportunity for that person to discover if our care could improve their symptoms and better their health. If you are interested in getting started with BStrong4Life you, feel free to call about using this certificate. If you are reading this and find you have either never been a patient or have not been seen in our office for over two years, feel free to use this as an opportunity to get yourself back in to see us. This certificate is only good from January 1, 2015 through January 31, 2015. This cannot be combined with any other offers and has no cash value. We are not able to extend this offer to patients with Medicare or Medicaid due to legal restrictions. If you have any questions, concerns, or want to make your appointment give us a call at 630-232-6616 or email me at brycejdc@stakerchiro.com.